A few years back, Frederic Malle announced a capsule collection of fragrances that would sit just outside his main line, taking inspiration from a different source: those people that M. Malle admires deeply. Unlike most capsule collections, ‘par Frederic Malle’ launched only with one scent and it has taken a good few years for another fragrance to follow in the series. It seems that Frederic Malle’s painstakingly focused approach applies not only to his scents but to those he chooses to collaborate with. His first collaboration was with the Belgian designer, Dries Van Noten, a man known for his cerebral couture, and now Malle follows Dries with yet another designer, one who is on the other end of the fashion spectrum – this time Frederic Malle has collaborated with the incomparable designer Alber Elbaz (formerly of Lanvin). It was admiration that led Frederic Malle to Alber Elbaz and through Malle’s wife’s love of his clothes these two wonderful minds were brought together. The collaboration is one of mutual respect and feels very organically grown yet and it pairs three creatives with who respect, above all, quality, artistry and beauty. Those creative men are Frederic Malle, Alber Elbaz and Dominique Ropion and the result of their trio of awesomeness is Superstitious (yes, I also think of the Stevie Wonder song whenever I hear the name, don’t worry) – a fragrance that feels entirely new yet wholeheartedly classic at the same time. The scent itself started its life as a work in progress – a grand aldehydic floral with a “classic architecture” worked on by Malle and Ropion for more than a year. 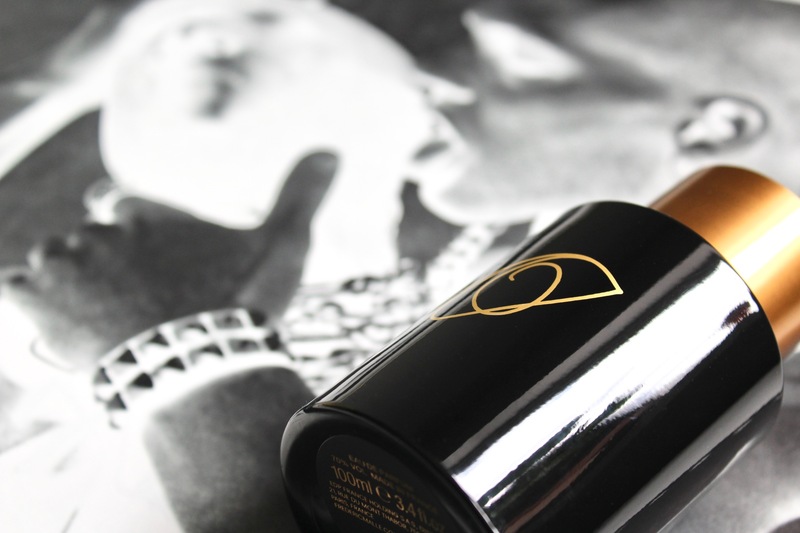 Alber Elbaz was introduced to the fragrance (after Malle reportedly had to convince Ropion to “give up his fragrance”), fell in love and then worked with the perfumer to bring it to completion. The rest, as they say, is history. The parallels between couture and fragrance are drawn quite strongly with Superstitious and Malle says that the scent was created in the manner that old fragrances were, with the perfumer working in isolation before presenting it to the client, who then requests it to be tailored to their needs, just like a piece of couture. The result? The most special of collaborations. Marilyn Monroe knew a thing or two about glamour, I’d say, and in her iconic performance of the Carol Channing-composed ‘Diamonds are a Girl’s Best Friend’ in Gentleman Prefer Blondes she said it best when she said that, when it comes to diamonds, a man better get you the real thing, or else. 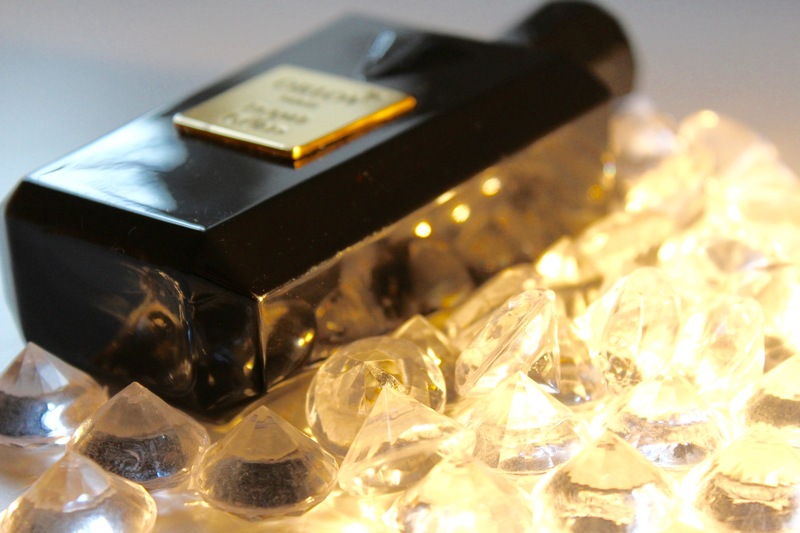 Like diamonds, niche perfumery should be subject to such a discerning set of rules because, let’s face it, there are many pretenders out there – tons of cubic zirconia brands that offer a pretty package but not much in the way of honest olfactory beauty. Niche fragrance is all about offering something special, something unique and something more luxurious than the mainstream fair, and many brands provide sparkle, but none of the lasting interest that they should. One brand that I recently discovered with both style and substance is Orlov Paris. I’m a sucker for a good story and theirs is one that is refreshingly devoid of tacky gimmicks. Brand founder Ruth Méaulle is a Gemologist who loves fragrance as much as she does diamonds. Having worn some cracking scents in her life, the likes of Carnal Flower and having gifted equally wonderful fragrances to her mother (Amarige) and husband (Vétiver Extraordinaire), Méaulle realised that she had followed one perfumer with each of these fragrant choices: the legendary Dominique Ropion. So it makes sense that, when Méaulle decided to start her own fragrance house, Orlov Paris (Orlov being Russian for ‘Our Love’), Monsieur Ropion was the only nose she could work with. Each of the fragrances within the Orlov Paris collection is inspired by a legendary stone, with the first five taking their inspiration from iconic diamonds. The best seller, Flame of Gold, is named after the Diamonds International award winning canary yellow diamond of the same name, which weighed in at a whopping 29 carats. Originally set in a necklace but later purchased by Texas oilman E.E. “Buddy” Ogelmen for his wife, Oscar-winning actress, Greer Garson, the location of the diamond today is unknown. Like the stone, Flame of Gold the fragrance is mysterious and dazzles with warm light in shades of yellow, glowing with amber, vanilla, leather and cedar wood. Talk about divine. For me, the summer season mean one thing: cologne. There is nothing better on a hot day than a generous spritz of a refreshing eau de cologne, except a water fight perhaps, but those are harder to come by in one’s old age. As far as colognes go, there is no beating Cologne Indélébile, the everlasting cyber-cologne created by perfumer Dominique Ropion for Editions de Parfums Frederic Malle. Cologne Indélébile squeezes lemons the size of the sun into its bottle, boasting metallic freshness, hay-like neroli and a whirlwind of technical musks to keep it going up & up, and on & on. 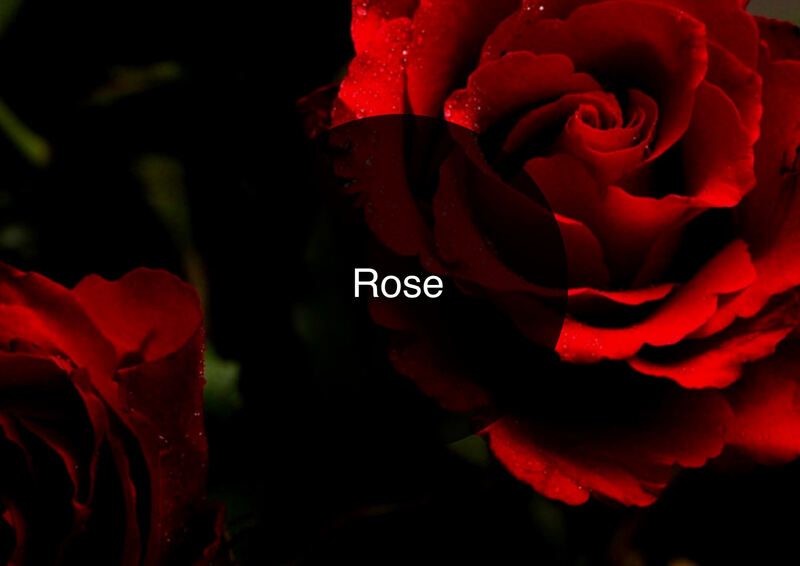 It’s a marvel of perfumery and now there’s a new way to make it last even longer. This summer Editions de Parfums Frederic Malle are launching an accompanying Body Wash and Body Milk to the Cologne Indélébile, promoting the idea that to make your cologne truly everlasting, it’s best to layer up! So before spritzing on twenty sprays of Cologne Indélébile (something I am often guilty of), one can lather up in a deluge of delicately soft bubbles scented with Malle’s neo-cologne, before then smoothing on a moisturising layer of the Body Milk and then finally, spraying on the fragrance to finish. By building layers of the scent on the skin, one can dial back on the sprayer a bit so that Cologne Indélébile really can last longer than the average British summer. A long time ago in a galaxy far, far away, a silence overtook the stars. Thirteen years had passed since the Empress Angel ascended her galactic throne, and loneliness had taken hold in her couture heart. All around her she saw nothing but copycats, pale imitations and weaklings that couldn’t live up to her fierceness, her avant-garde angles nor the sheer power of her olfactory force. She was a supernova of edible treats over a dark nebula of patchouli and the others couldn’t compete. Angel longed for a sister, an extract of her fearless DNA that danced along the same double helix. Little did she know that she would get more than she bargained for, and she imagined into being a friendly rival who shone brightly over the galaxy and threatened her reign. Or something like that, anyway…. 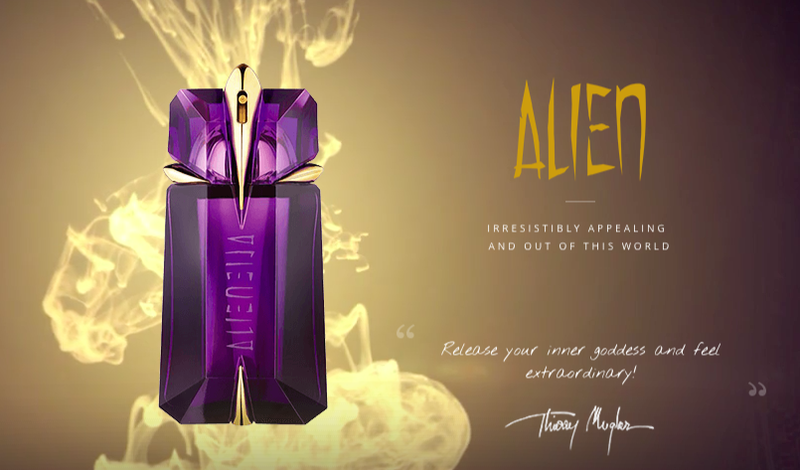 Back on Earth in 2005, 13 whole years after launching his debut fragrance, Angel, fashion designer, Thierry Mugler launched Alien, his sophomore perfume. Few designers and brands are so patient however, the Mugler model is one of perseverance where fragrances are allowed the time to find their target market, and to grow fondly in the hearts of their fans. Take Angel for instance, a perfume that was as divisive as Marmite when it was launched, and in fact, still is to this day. Mugler and Clarins (who hold the Mugler license) started with a small launch and invested both time, and care in slowly building a fan base, and a name for their product until it became one of the best selling fragrances in the world – an accolade that it still holds today. Both Alien and Womanity (2010) have followed this blueprint, receiving long-term success rather than being quickly canned if they weren’t immediately successful in their first few months on the market. That said, Alien seems to have been fairly popular right from the outset, due perhaps in part to the fact that, whilst it is utterly distinct (there really is nothing quite like it still to this day), Alien isn’t quite as hard to get along with as the others. Don’t get me wrong, Alien is still a complete weirdo of a woody jasmine, but somehow it manages to bridge the divide between fantasy and reality, making for an accessible olfactory experience, enjoyed in full 3D and iMax.